InterContinental Hotels Group (IHG) announced the opening of Holiday Inn Express Cologne City Centre, the largest Holiday Inn Express in Europe. The newly opened property features 323 rooms all featuring the next generation Holiday Inn Express design which balances home comforts with smart design features. Guests can enjoy sound absorbing headboards, bedside USB ports and flexible in-room working spaces. Free Wi-Fi and a continental breakfast buffet are also included in the room rate. Ideally located, the hotel is walking distance to the Old Town or a short U-bahn ride to the famous twin spires of Gothic Cologne Cathedral tower. Within a short distance of Poststraße and Severinstraße U-bahn stations, as well as Cologne Central railway station. If flying in or out, Cologne Bonn Airport is only 25 minutes' drive away. Mike Greenup, Vice President, Brand Management for Holiday Inn Express commented: "At Holiday Inn Express we know what matters to our guests. Successfully delivering on that brand promise has enabled Holiday Inn Express to grow rapidly across Europe in recent years, and particularly in Germany. In 2017 alone we have opened 5, and signed 11, new Holiday Inn Express properties in Germany. The Holiday Inn Express Cologne City Centre is a great addition to that portfolio." 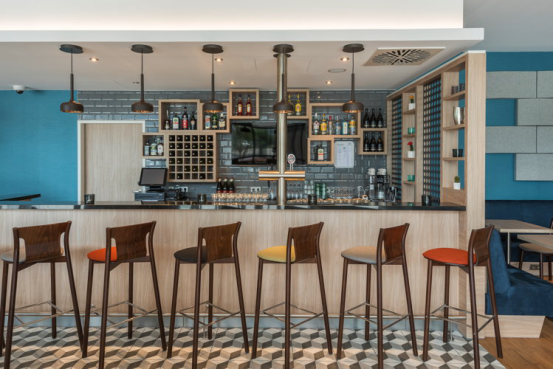 Sonja Comberg, General Manager, Holiday Inn Express, Cologne City Centre commented:"Holiday Inn Express is designed for savvy travelers who want a straightforward, uncomplicated experience, delivered in an engaging manner. We support guests without hassle, without complication, without extravagance - but always with a warm smile. We're extremely excited to open a new haven for travellers right in Cologne's city centre and look forward to welcoming our future guests." There are currently 32 Holiday Inn Express hotels in Germany, and a further 29 in the development pipeline. In Europe, there are 239 Holiday Inn Express hotels with 60 in the development pipeline. Across all brands, IHG now has a total of nearly 120 hotels open and in the development pipeline in Germany.